From the land that brought you the 100 Mile Diet, Kristeva Dowling takes it all a step further, getting back to the land in a very determined way in order to control what gets to her table. When I started off on this journey I thought that I would simply be growing my own food, learning to process and preserve it and quietly eating it. I didn't think the act of drinking milk would become a political debate. I didn't count on becoming hot and bothered about farmers' right to farm and consumers' right to choose…. My life, and the simple act of eating, has taken on a richer meaning. I now live and eat more consciously. 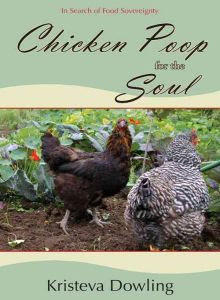 Chicken Poop for the Soul (Caitlin Press) for the soul charts that journey, following Dowling as she heads to the land and, in all ways, starts a new life. Dowling’s wordsmithing is not as elegant as one could wish, but it is heartfelt and well-remarked and researched. Readers with a commitment to finding the best paths to local and organic eating will find much to enjoy here, and perhaps occasionally shake their heads at the stupidity of government and a culture that often seems to be entirely populated by sheep.